I coach Run Ann Arbor training programs and provide runners with training schedules. I engineer group runs with directional signs and water stations. I create all the courses for the group runs, set-up/tear-down the courses, maintain and furnish all the equipment needed for the group runs. I provide all supplies, food, and drinks for the group runs. I dispense weekly emails to the Run Ann Arbor members. I cultivate a “social group” for the “members”. I provide broadcasting, data processing, and communication services. 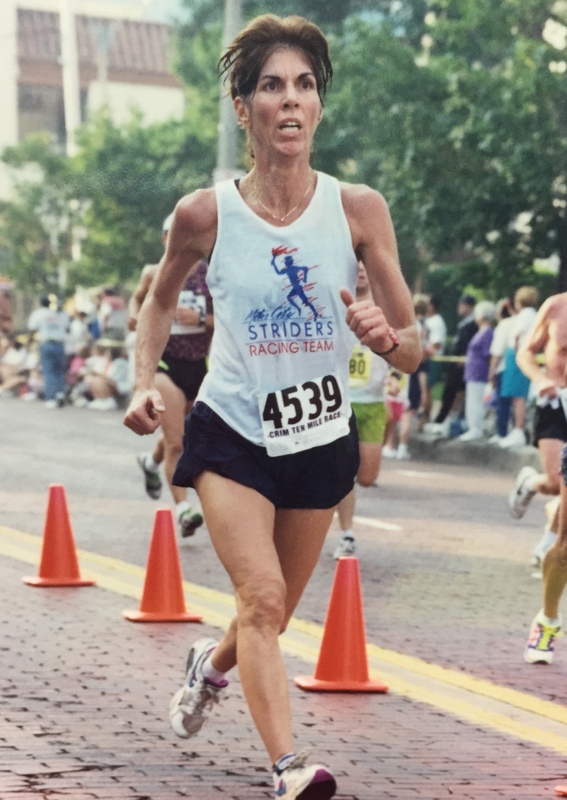 I have been running for over 40 years and have been providing group runs for the Ann Arbor community since 1998. I know what is important for a long run to be successful and I want to provide that for other runners – water stations, a variety of marked courses, a group of runners who can run with other “like paced” runners, camaraderie, and best of all – a whole lot of fun. I provide group runs that are safe and fun. I am a retired registered nurse, but my “passion” is running. 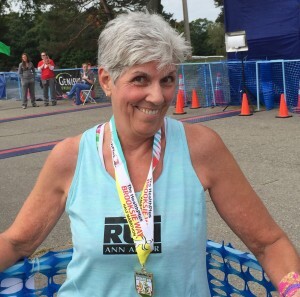 I have run 10 marathons, over 100 half marathons, and I had an addiction for 5Ks. I had some pretty good personal bests back in 90s: 5K 19:59, 10K 42:14, 10 mile 69:34, half marathon 1:38:22, and marathon 3:43:49. As the years progressed and my focus turned to “coaching”, my fast paces slowed. Today I no longer run marathons and have a PR for my half of 2:30. You will find me at the back of the pack, but I am lucky to have experienced the fast and the not-fast paces of running. I qualified for Boston at three marathons and ran Boston in 1998. 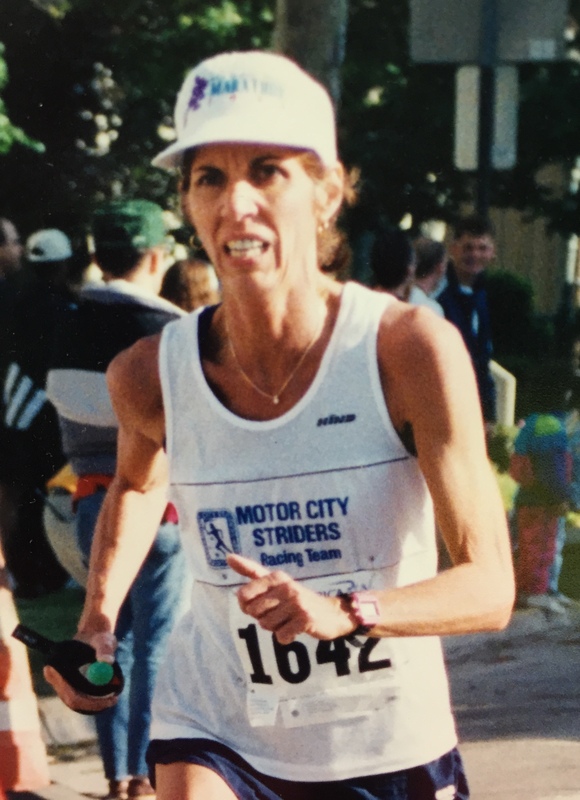 I trained with the Motor City Women’s racing team in the 90s and helped the team obtain the Gold Medal for the 10K at the World Championships in Toronto in 1994. I got certified as an Adult Running Coach by the RRCA in 2000, and in 2008 I became certified as an WellCoach by the American College of Sports Medicine Wellcoaches program. I have many years of experience with the average runner, the beginner runner, and the runner who is looking to improve his/her running paces. Although I never sent anyone to the Olympics, I have sent runners to Boston. I can recognize and relate to the goals and motivations of the fast and the not-so-fast runner. A bit of background: I started a running group in 1998 called “Two Dogs Running“ with a bunch of Ann Arbor running friends. In 2002, I created a 18 week “Half and Full marathon” training program called “501”, and my running group grew to well over 200 runners. In May of 2015, I met with two of my long time acquaintances, Nick Stanko and Ian Forsyth and agreed to start my Saturday group runs from the Ann Arbor Running Company store. And then..”Two Dogs Running” became “Run Ann Arbor”.